Two more of Saori’s Blaze focused cards are revealed today, meant to burn out the opponent’s field and recover costs. AUTO: [Counter Blast 1 & Soul Blast 1] When this Unit is placed on (VC) or (RC), you can pay the cost. If you pay it, choose 1 of your opponent’s Rear-guards in the same column as this Unit, and retire it. CONT (VC/RC) Generation Break 1: If your Unit is Blazing, for each of your opponent’s back row (RC) without a Unit, this Unit gains Power+2000. 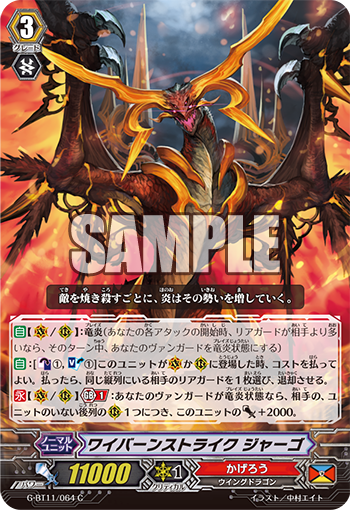 AUTO (RC) Generation Break 1: [Retire this Unit] When your turn ends, if your opponent has no Rear-guards, you can pay the cost. If you pay it, Counter Charge 1, and if you have 3 or more Rear-guards, Draw 1 card. For Today’s Card we’re introducing the following from the 11th Booster “Rogue Deity Descent” (on sale June 9th, 2017, the 《Kagero》 【Blaze】 support “Wyvern Strike, Jargo” and “Dragon Monk, Shinsen”. “Wyvern Strike, Jargo” is a Unit that combines Retiring with strengthening itself. When it’s placed on the Vanguard or Rear-guard Circle, you can Retire 1 of your opponent’s Rear-guards in the same Column as this card. Since it has no Generation Break attached, you can break your opponent’s board early on. And, for each of your opponent’s back row Rear-guard Circle, this card gains Power+2000! If your opponent has absolutely no Rear-guards in their Back Row, this card, without a Cost, gains a total Power+6000! And since it itself has 【Blaze】, when the turn ends, you can use the skill of “Dragonic Blademaster “Kouen”” to recover it from the Drop Zone. “Dragon Monk, Shinsen” is a Unit that recovers Costs. If your opponent has no Rear-guards, it can Retire itself to Counter Charge 1 card, then if your opponent has 3 or more Rear-guards, you can draw 1 card. Since 《Kagero》 is a clan that specializes in Retiring Units, it’s rather easy to fulfill the conditions of “When there are no Rear-guards”. By aggressively Retiring your opponent’s Units, you can aim at activating this ability. “Rogue Deity Descent” includes many cards with excellent 【Blaze】 related abilities. From here on out, we’ll be continuing to introduce cards from the 11th Booster “Rogue Deity Descent”. Be sure to enjoy!